It’s been awhile since we talked about the technical aspects of our production, and while most of our entries in the realm have been on the shortcomings of no-budget filmmaking, we’re happy this time around to report on a success. To our surprise, we didn’t receive a single comment on the hanging of the henchman Saul, as played by Omar Gonzalez. Omar was an incredibly good sport at our shoots—dealing with fake blood on his face and clothes, being repeatedly dragged across the floor, and doing his own stunt falls when shot in the back take after take—but despite what you see on-screen, we did not hoist him up by his neck and hang him from a street lamp. In fact, we didn’t hoist him up at all. What you see on screen (or more pointedly, what you don’t see) is one of the many low-profile digital tricks we’ve pulled in The West Side to date. The street corner is real, the lamppost is real, but the rope and Omar are not there. In fact, we filmed him weeks later on my roof. After filming the street corner scene with our actors Brendan Donnelly and James Sampson, who looked up at a body-less streetlight during the shoot, we needed to insert a hanging, swaying Omar into the shot. Not wanting to actually hang him from the streetlight due to obvious safety issues, we were left with a background plate in hand and a need to film a swinging body somehow, somewhere. To approximate the low angle of the camera, we needed to get the camera below Omar; the elevator shed on my apartment roof offered one such opportunity. But because there was no structure above the shed, we wouldn’t be able to hang Omar from a harness, which we wanted to do in order to give us realistic swinging action. 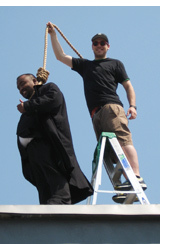 Instead, Omar stood on the edge of the roof and swayed in place slightly while we looped the noose over his head; Zack held the rope as if he were the lamppost. Then, in a separate shot, Omar sat on the ladder and swung his feet. In a third shot, Zack held a length of rope taut, with which we’d virtually string up Omar. The sky behind Zack and Omar served as our no-budget blue screen. We brought a laptop to the roof to quickly superimpose Omar on the background plate and eyeball the angle of the body to ensure it would work. Then later in After Effects we composited in Omar, attached his swaying feet to his body, stretched the rope over the lamp and to the ground, and voilà. It ain’t perfect, but for zero bucks it’s a pretty good trick. As for the fact that no one commented on either instance of the effect—it closes Episode Two and has an encore in the opening scene of Three—we will take that as a compliment!